Boreas, Son of the Winter Maiden, is defined by his single-minded obsession to bring to Midgard an eternal winter with all of its deadly aspects, including biting cold, blinding blizzards, and bloodthirsty snow beasts. 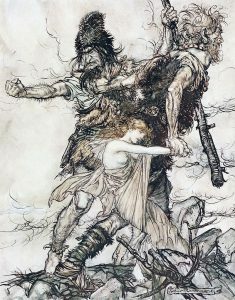 Those who worship Boreas are either creatures that delight in extreme cold environs due to their genetic composition, such as giants, trolls, and yetis, or pragmatists living in the Northlands where the dangers of debilitating winter storms, hypothermia, and snow blindness must be overcome on a daily basis. Many of the former disciples share in Boreas’s predilection for committing acts of evil while the latter followers pay homage because they believe in the veracity of the prophecy that Boreas will one day cover Midgard in eternal winter, and it is to their benefit to be in his good graces when that time comes. Deities: Boreas, Mara, and deities that claim dominion over areas composed of vast stretches of ice or tundra. Granted Powers: You can imbue your attacks with biting cold, create weapons of ice, and send forth blasts of razor sharp ice to damage your foes. In addition, you gain resist cold 5. Ice sheath (Sp): With a successful ranged touch attack against the wielder’s AC, you can cause the held weapon of any foe within 30 feet to become encased in a layer of ice for 1 round which deals 1d6 points of cold damage + 1 point for every two cleric levels you possess. Additionally, the wielder of the weapon suffers a -1 penalty on attack rolls for 1 round due to the weight imbalance created by the ice sheath. You can use this ability a number of times per day equal to 3 + your Wisdom modifier. Chilling strike (Su): At 8th level, you can give a weapon touched the frost special weapon quality for a number of rounds equal to 1/2 your cleric level. You can use this ability once per day at 8th level, and an additional time per day for every four levels beyond 8th. Domain Spells: 1st-icicle dagger (UM), 2nd-holy ice weapon (ACG), 3rd-frost fall (UC), 4th-ice spears (Pathfinder Campaign Setting: Inner Sea Magic), 5th-holy ice (UM), 6th-cold ice strike (UM), 7th-glacial cold*, 8th-ice soldiers*, 9th-icy prison, mass (UM). Spells marked with an asterisk (*) are new spells detailed below. The following spells are used by clerics of Boreas. Upon your final utterance, the target area is covered in glacial ice which generates a limb numbing cold that causes 1d6 points of cold damage per caster level (maximum 20d6), and inflicts the fatigued condition, as well as a -5 penalty to Perception checks. A successful Fortitude save halves the cold damage, and negates the fatigued condition and the penalty to Perception checks. This damage is instantaneous, and occurs only on the first round of the spell. For the remaining duration of the spell, a successful DC10 Dexterity check is required to accomplish any move action that requires manual dexterity such as loading a crossbow, drawing a weapon, picking a lock, retrieving a stored item, or manipulating a material spell component while a creature is in the area of effect. A failed check means the item is dropped. Likewise, when walking on the icy surface, a DC10 Acrobatics check is required to move at half speed. Failure means movement is not possible in that round, while failure by 5 or more results in falling prone. 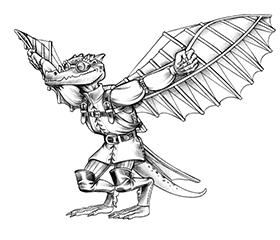 This spell imbues a humanoid creature with 4 or fewer Hit Dice with such cold that its teeth begin to chatter and its body shakes uncontrollably, such that casting a spell or loading a missile weapon is made impossible. Humanoids with 5 or more HD are not affected. If the subject fails the Fortitude save to perform one of these actions, it may instead choose to take a different action. Once a creature has suffered the effects of this spell, it is immune to the effects of this spell for 24 hours. Your physiology becomes similar to that of a creature born in the arctic cold of the tundra. You gain cold resistance 30, are unaffected by conditions that cause snow blindness or hypothermia, and can move across icy surfaces at your full speed without needing to make a skill check. In addition, all attacks you make with a melee or natural weapon deal 2d6 points of cold damage beyond the normal weapon damage. Finally, you gain the weakness fire vulnerability for the duration of the spell. In an instant, this spell causes the creatures in the area of effect to experience a day’s worth of exposure to blinding light reflecting off of blankets of white snow. Creatures suffer a -10 penalty to Perception skill checks, and attacks made with ranged weapons suffer twice the penalty for each range increment. In addition, creatures in the area of effect suffer such hampered vision that foes targeted by them are treated as having concealment (50% miss chance). A successful Fortitude save reduces the severity of the hampered vision such that the miss chance is 20% instead.